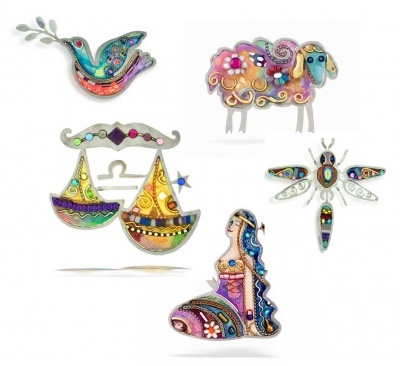 Perfect to hold a scarf or shawl in place or simply as a special piece of bling on a pullover or cardigan. We just brought in a few more, including the most popular Sheep which somehow really reminds me of the logo of our friends at The Unique Sheep. And two of our newest ones represent the current and up-coming Zodiac signs, Virgo and Libra! Please note that quantities are very limited. 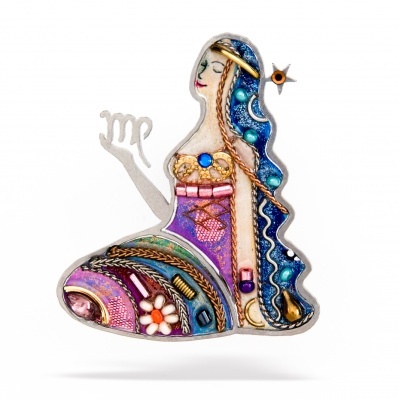 Wearing this Pin is like wearing a miniature artwork, the intricate design is hand painted and set within a very light stainless steel frame. Austrian crystals, beads and a variety of other materials are delicately assembled and set in artist's resin resulting in a beautifully finished and durable piece. The collection conveys a refreshingly unique and highly creative signature. The pin is exceptionally well made and is produced in limited editions. The pins start with a very light stainless steel frame. 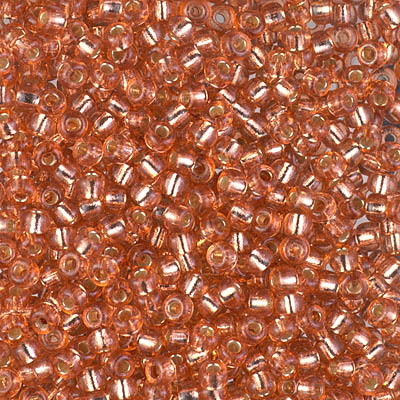 Then beads, crystals, and other colorful items are all delicately assembled and set in artist's resin resulting in a beautifully finished and durable piece. 1. The Sheep is a real smile-maker. Its golden swirls and beaded flowers make for one "fluffy" and sweet sheep. 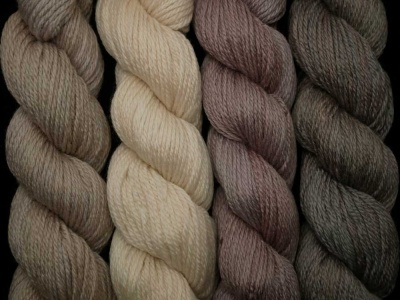 Many of us as lovers of yarn find ourselves especially drawn to sheep and this one is so close to the logo of TUS, it's just wonderful. 3. 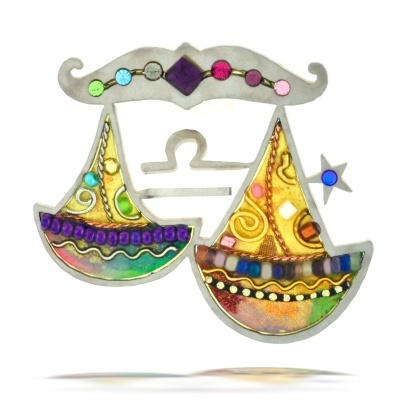 Libra is the sign that represents September 23 to October 22. Usually represented as the scales of justice, by balance and symmetry, Libras are said to be in a constant chase for justice and equality. 4. 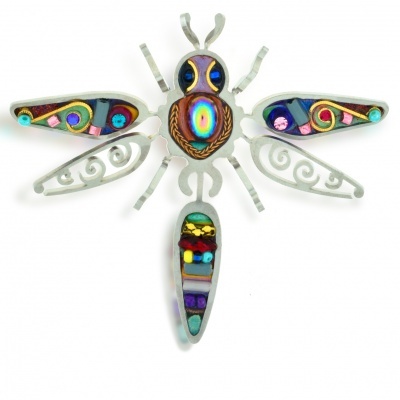 Dragonfly features glowing beads and crystals on its handpainted and decorated wings, body and head. 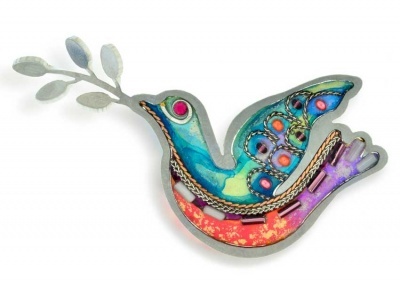 The beads and other objects have a variety of textures which add to the beauty of this pin. Its wings and tail are slightly angled giving it even more visual interest. A real mini-work of art. From the tip of the antenna to the botton of the body it measures about 2 1/4"; the wingspan is 2 1/2" at its widest part.